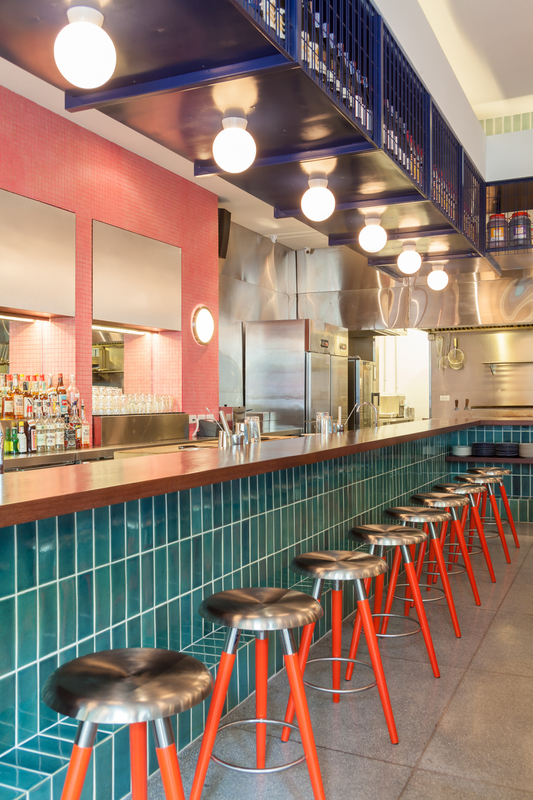 The simple Hong Kong brick-and-mortar shop which opened in 2013, has been described by DestinAsian 1 magazine as a "1950s American diner", where the "pink-neon logo" and the "retro-tiled floor" suggests a Hong Kong style cafe where "Wong Kar-Wai meets Grease." It is from this basis that designer, James JJ Acuna of JJA / Bespoke Architecture formulated the basis of their second global location, at the 72 Courtyard complex in Bangkok. 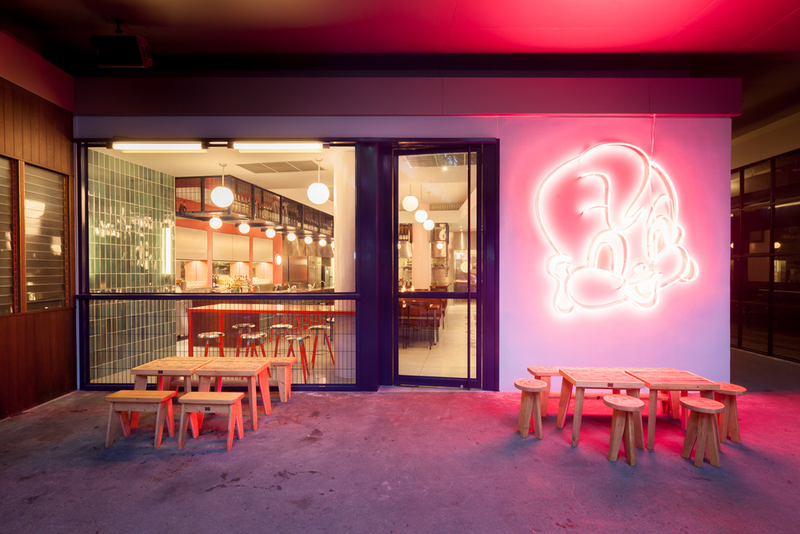 Seen as a next-generation version of the destination restaurant in Hong Kong, Acuña, in collaboration with branding consultant, Olivia Pong and graphic designers, Entendre Studio, conceptualised a true-to-Hong Kong, yet non-kitschy representation of the Little Bao brand that looks forward to the world, yet still honours its Hong Kong roots, romanticised through design details and elements which hark back to the glamour of the Old World Chinese cafe and Hong Kong 80's pop nostalgia. The liberal use of two-tone teal hand-glazed ceramic tiles and pink mosaics recall hundreds of Hong Kong's pencil towers which are rendered in similar colours. Glossy Navy-blue powder coated steel and wire mesh on the project's exterior and interiors recall the contemporary hawker stalls which line Hong Kong's streets. To add material warmth to the dining areas, the use of Red Cherry timbers are placed on all table top surfaces and low dining seats. To ground these intersection of colours stainless steel, chrome, white and grey terrazzo floors, and a grey pigmented formica were placed throughout the project to speak to both the contemporary nature of the brand yet underpinned by its Chinese roots. Other details of note, all furniture in the project is bespoke and was designed to maximise for the extreme comfort of the guest dining experience. As an added feature, all bar areas are only 900mm tall, allowing for both a casual experience with the servers but to give comfort to traditional diners as well. Little Bao is about sharing - food, drinks and culture. Little Bao, a modern Chinese diner, is influenced by the international tastes of its hometown Hong Kong. Big on sharing and little on the Bao, it’s an original take on classic Chinese comfort foods. From signature Chinese Bao burgers to a selection of sharing plates and original cocktails, Little Bao is always adventurous and playful - a fun and authentic cross-cultural eating experience. Established in 2012, Little Bao served their first original Chinese Bao burger at Hong Kong’s farmers’ market. The 12-hour slow cooked pork belly Bao with homemade pickles, fresh shiso and leek salad topped with sesame mayo and hoisin ketchup sold out within hours of opening. The lines, and the cravings, haven’t stopped since. In 2013, Little Bao opened its doors at the edge of Hong Kong’s Soho district with a small, 20-seat diner. The menu expanded to include Chinese influenced share plates such as braised short-rib dumplings, drunken clams, fried chicken with salted egg yolk alongside inventive cocktails such as Gin & Juice, Yuzu Leaf and Chris’ Lemonade. Little Bao is now a favourite destination for local and visiting foodies from around the world. The restaurant's founder, Chef May Chow, has been recently awarded "Asia's Best Female Chef 2017" by The World's 50 Best Restaurants organisation. Fit Out Contractor: Flexiplan Co. LTD.